The NDR Elbphilharmonie Orchestra under Krzysztof Urbanski play Kilar's Orawa, Bartok's Violin Concerto No 1, Dvorak's Symphony No 7, Holst's The Planets and Williams's Star Wars. The NDR Elbphilharmonie Orchestra under conductor Krzysztof Urbanski at Hamburg's magnificent Elbphilharmonie hall performing Wojcieh Kilar's symphonic poem for strings Orawa, then Bartok's Violin Concerto No. 1 with soloist Frank Peter Zimmermann, finishing with Dvorak's Symphony No. 7. Then, Urbanski returns to the rostrum for another concert with the North German ensemble, this time to perform a couple of suites taking us to the stratosphere and beyond: first, it's Gustav Holst's The Planets, which is followed by Star Wars, taken from the John Williams' renowned soundtrack. Performer: Frank Peter Zimmermann. Orchestra: NDR Elbphilharmonie Orchester. Conductor: Krzysztof Urbański. 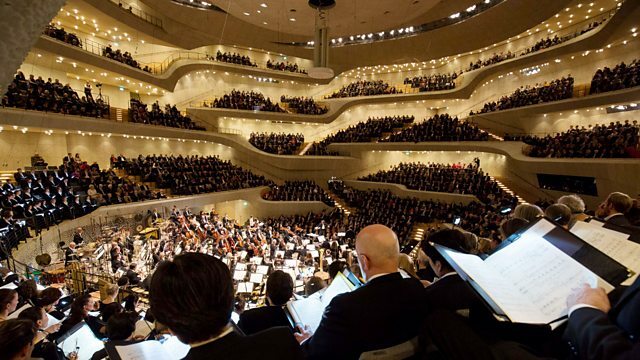 Orchestra: NDR Elbphilharmonie Orchester. Conductor: Krzysztof Urbański. Conductor: Günter Wand. Orchestra: NDR Elbphilharmonie Orchester. Beethoven: Symphonies 1-9: Wand, NDR-Sinfonieorchester.